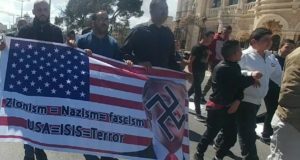 At least 700 Palestinians from the southern West Bank district marched on Thursday (8th May) side by side next to the largest key in the world to mark the 60th anniversary of the Nakba. 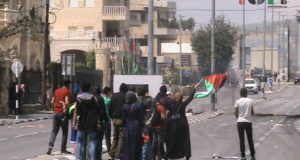 Today’s event, which was organized by the Palestinian Committee for commemorating the 60th Nakba year, started at around midday from the Duhyisha Refugee camp located in the southern part of Bethlehem. The event started as a truck arrived with the largest key in the world, and then people followed all the way to Al Azah refugee camp then to Ayidah refugee camp were the key was installed on a concert gate. The key represents symbolize the right of retune to the Palestinian refugees. Speeches were delivered as the key was installed on top of the gate. The first speech was delivered by an old man, Haj Abu Ahmad, who witnessed the Nakba first hand. 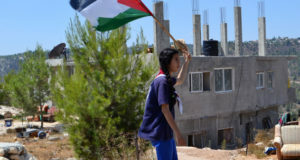 The commemoration of the Nakba – Palestinians remember the creation of the state of Israel on their land in 1948, which resulted in the displacement of over 700,000 people from their homes, and the imprisonment of the rest into refugee enclaves in the West Bank and Gaza Strip.